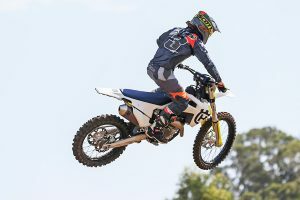 MotoOnline.com.au tests the 2019 KTM 350 SX-F. Being one of the only manufactures to produce a 350, KTM really caters for the median power range chaser. Don’t be fooled though, these bikes aren’t just the weekend trail blazer type of bike, you really have the best of both worlds when it comes to the 350 SX-F – you have the ability ride the wheels off it like a 250, yet at the same time you can really use the torque of the engine like a 450, just on a slightly smaller scale that is more subtle and easier to control. 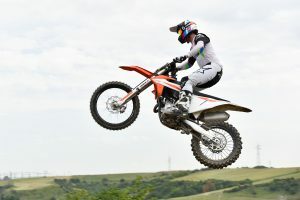 Testing the bikes in the green undulating hills of Pista Malagrotta was a real buzz, it also delivered a great testing track to gain accurate feedback on the all-new KTM range. A range of different track surfaces and plenty of bikes on the track at one time allowed it to form up quite well. We managed to get lucky with the weather – a couple of light showers kept the track in perfect riding conditions all day. There were a couple of spots that ended up forming really good braking bumps and lines to really push the 350 SX-F to their potential all day long. 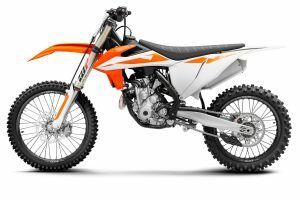 For 2019, KTM has reevaluated its 350 SX-F engine and in turn delivered a small power house that weighs a mere 26.6kg. 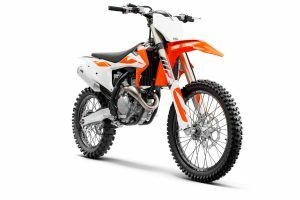 The ultra lightweight engine delivers a very versatile power delivery with a max rpm range of 13,400rpm and a 57hp power output – this thing is sure to put you on the competitive edge. They have equipped the newly developed DS clutch in the 350 also, which it’s compact and rivet-less construction contributes to the lightweight design of the engine that also offers unbeatable reliability. The clutch is extremely heat resistant with steel clutch plates to ensure a smooth disengagement whilst a diaphragm spring is fitted so very little force is required to operate it. 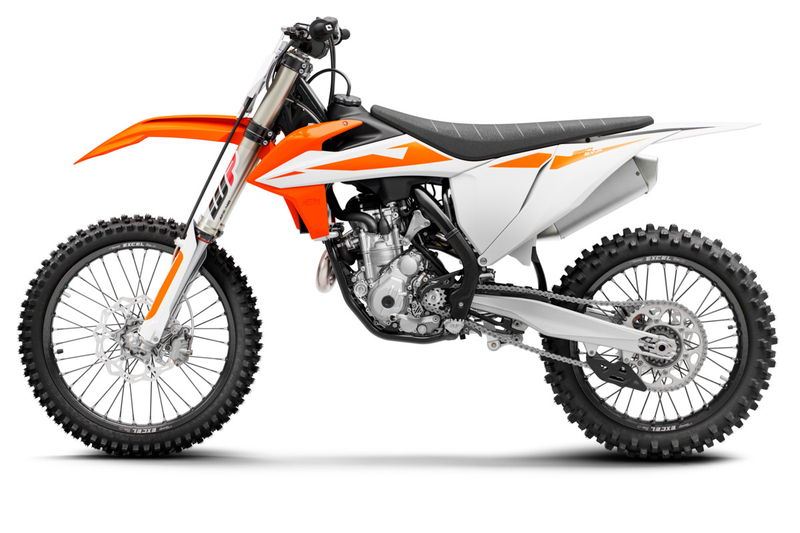 Just like all the other KTM four-stroke models, the 350 SX-F is fitted with a forged bridged box type piston produced from CP, the 350 has an 88mm bore where the piston crown geometry has been perfectly adapted to the combustion chamber, and in addition to the high compression ratio of 14:1, this engine delivers an extremely lively performance. 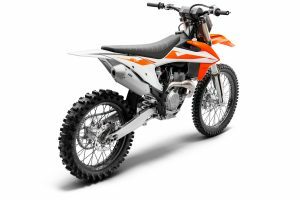 There is a state of the art Keihin engine management system equipped on the KTM, while the electronic fuel injection features a 44mm throttle body with a new innovative injector position which delivers immediate throttle response. 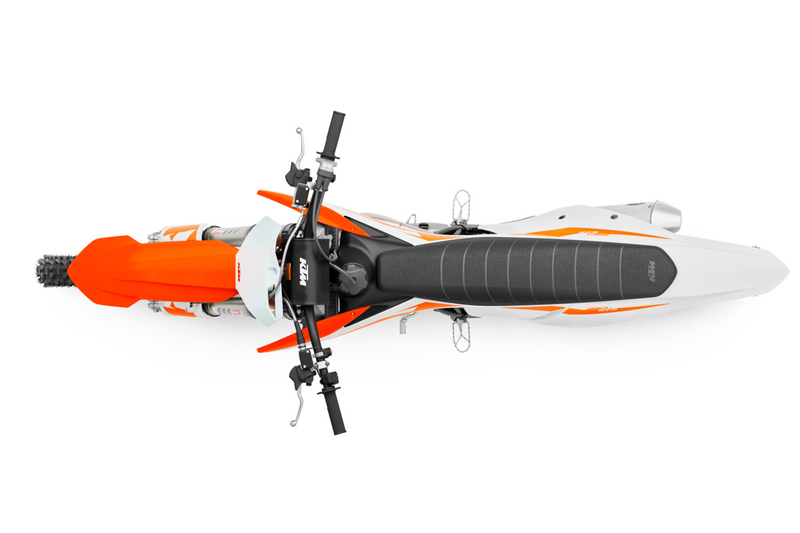 There is a modified throttle cable mount that provides a smoother routing of the cables with easier access. The ECU has been remapped to comply with the new exhaust and cylinder head design – there are a range of different maps for specific power curves depending on what gear you select, this all runs from the gear position sensor. There is a nifty little plastic tray underneath the seat to house the ECU and other electrical components to keep them in their place, increasing reliability and preventing any damage. The is engine really is the best of both worlds and I can really see it suiting both guys in the trail or weekend riding environment that just want a bike that is light and nimble to cruise around on, yet still has enough power to stick with their mates on the big bores, and I can really relate to the guys who want a bike that they can ride the wheels off but still have that explosive power. 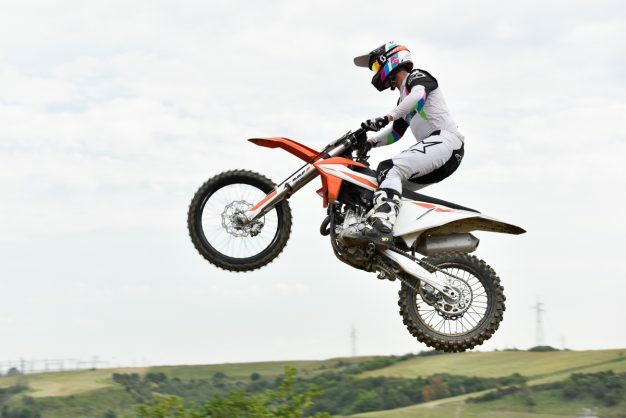 However the KTM 350 SX-F is definitely a racing machine if it’s ridden to it’s potential – remember when it was first bought out in 2010 that Antonio Cairoli won a world championship on a 350 against all his competitors on their 450s. The motor in this bike loves to be revved and the more you rev it the more it rockets off. It’s like riding an extremely fast 250 when you really test its potential, the central masses are so well balanced it feels like a 250 except its just another 10 or so horsepower faster. 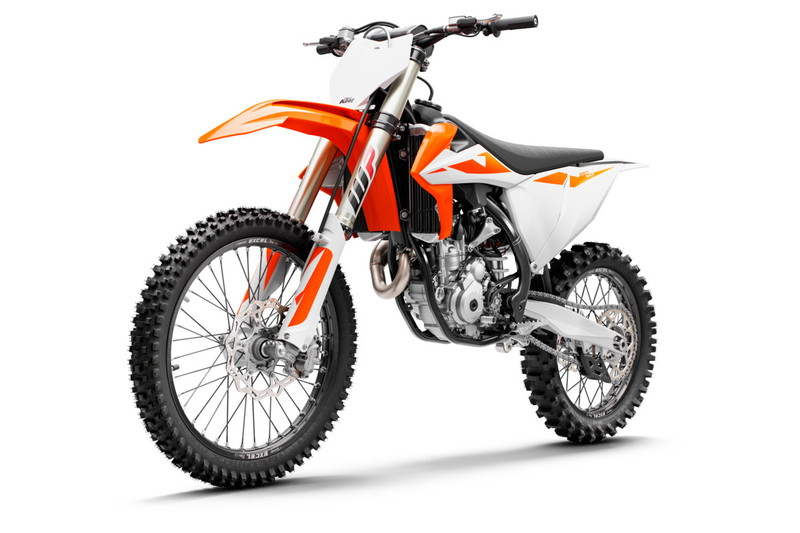 On the other hand though, you can cruise around on this bike all day labouring the engine with ease and the lightness really helps you not to fatigue as much in comparison to wrestling a 450 around the track. Being such a high revving engine, I’d personally prefer a 13 tooth front sprocket opposed to the 14 just to give it more spark straight from the get go. It’s a more linear bottom end power than what you would expect and because you have to really rev these things to get them to take off, this would help boost up the bottom end power without having to over ride the bike. The more laps you do on the 350 SX- F the faster it makes you want to ride it – it’s a real fun machine that drives the racer out of you. The chassis and handling of the new model 350 is really well balanced, again like the other models the frame, swingarm and subframe has been modified to enhance the handling characteristics of the new range. 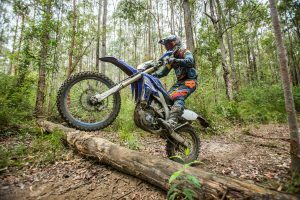 This provides a really stable and predictable ride across the board but the 350 really benefits from these upgrades – it has a really balanced weight between the engine and the rest of the bike. It’s not too heavy nor too light, or too powerful nor too slow, which really delivers a very consistent and comfortable ride. 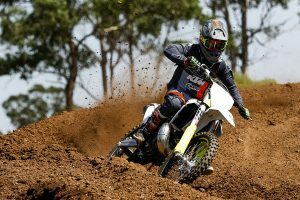 The new updated fork and shock setting compliments the frame geometry and provides a real sense of security through the roughest parts of the track while assisting in plenty of stability throughout the corners whether they were hard slippery flat turns or rutted and choppy. 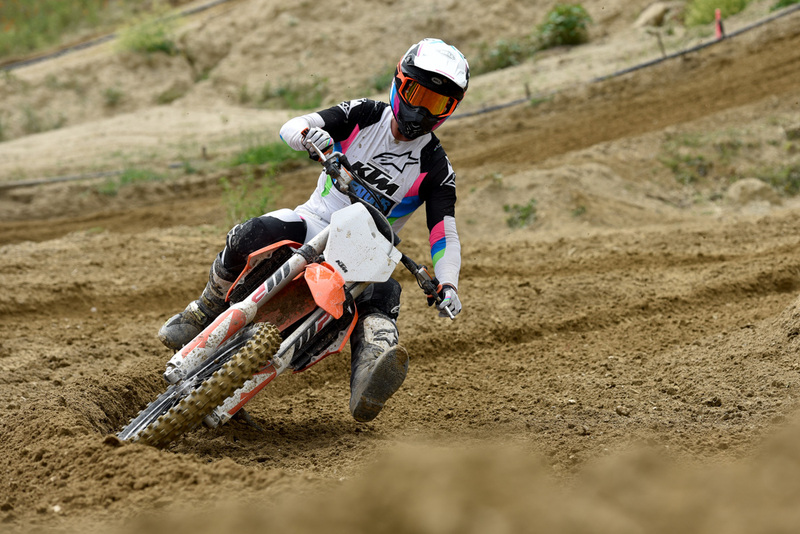 There were a couple of bikes equipped with KTM Powerparts products available for testing at the track also, the one thing I really noticed when I would ride one with the Powerparts triple clamp – the front end really sat in the corners even better, it almost became effortless to turn. The down side to this though the fork action through the braking bumps became a little more harsh as the Powerparts clamp allowed more flex. The beautiful part about having such adjustable forks on the KTM range is that I was able to put a few more psi in the fork to compensate the harsh feeling and then I suddenly had a bike that held up in the bumps with a smooth action but also had effortless turning ability. 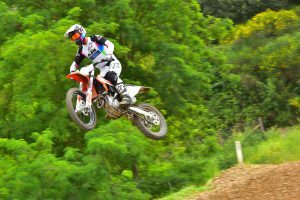 There are a range of parts in the Powerparts catalogues that can really upgrade the performance of the bike and are definitely worth checking out. 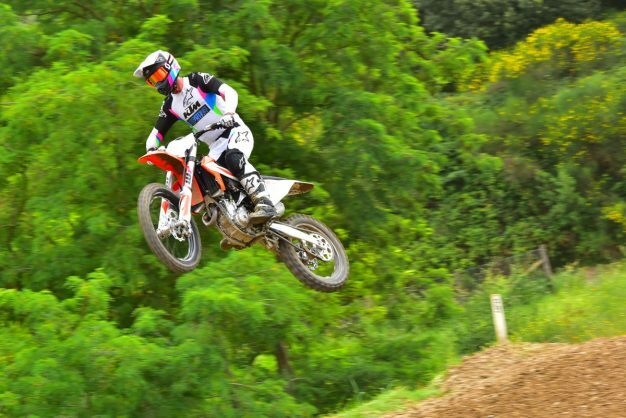 If you want an extremely versatile bike that you can take and compete anywhere then a KTM 350 SX-F is the go, or if you aren’t into competing and just want a bike you can do a bit of everything on, then this would be my bike of choice. 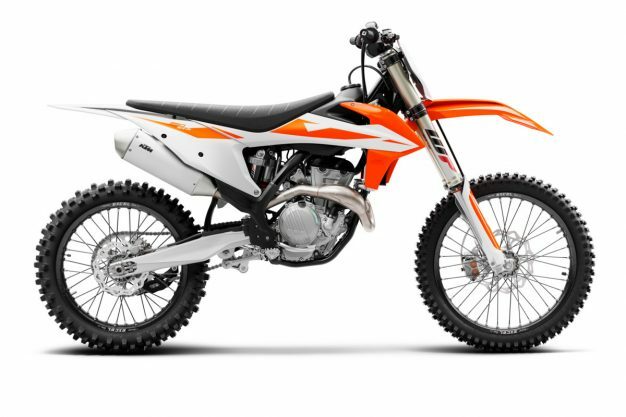 It’s a very quality machine that delivers an immense amount of fun, it’s lightweight, very fast, got all the torque you need for climbing steep hills off-road or riding tall gears around the motocross track. The 350 will handle everything you throw at it while providing you some of the most fun and enjoyable moments you have spent on a motorcycle.